Casey loves Halloween. 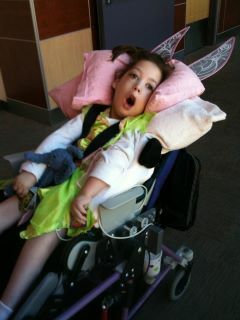 She wore her Tinkerbell costume to school yesterday. Her teacher brought in 2 of her puppies and dressed them up as well. After school Casey went to trick-or-treat at all of her doctor’s offices. They were all very excited to see her. She had a great time. On our way home from visiting all of her doctors we stopped by my grandparents (her great grandparents) for a short visit. Casey was about to crash by the time we got there so we could not stay long. After taking a good nap Casey was ready for round 2. We got back into her costume and went trick-or-treating to a few houses in the neighborhood. I was happy to see that there were a few that registered with CLU as homes with non-food treats. 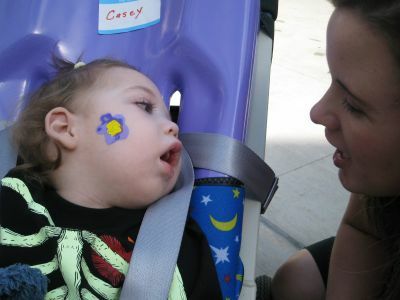 Hopefully as this catches on even more homes will think about kids like Casey when getting ready for trick-or-treaters. Casey was so proud of her Halloween treats. We got home and she snuggled with Daddy while I handed out stickers and toys. When she went to bed there was no fighting at all, she went straight to sleep and slept hard all night. Tinkerbell was exhausted 🙂 It was pretty cute, the glitter on the wings kept shedding. It was like she was leaving a little pixie dust trail behind her. 2007 Casey had her foot surgery early October, so we had to work with 2 full leg casts. Tim found a glow in the dark skeleton shirt and it was perfect. 2008 Casey was a blue flower fairy. She picked it out all by herself. We took Casey to a costume shop and she shocked us all. She was very into yellow at this time so the blue was a surprise. She was a beautiful blue fairy. 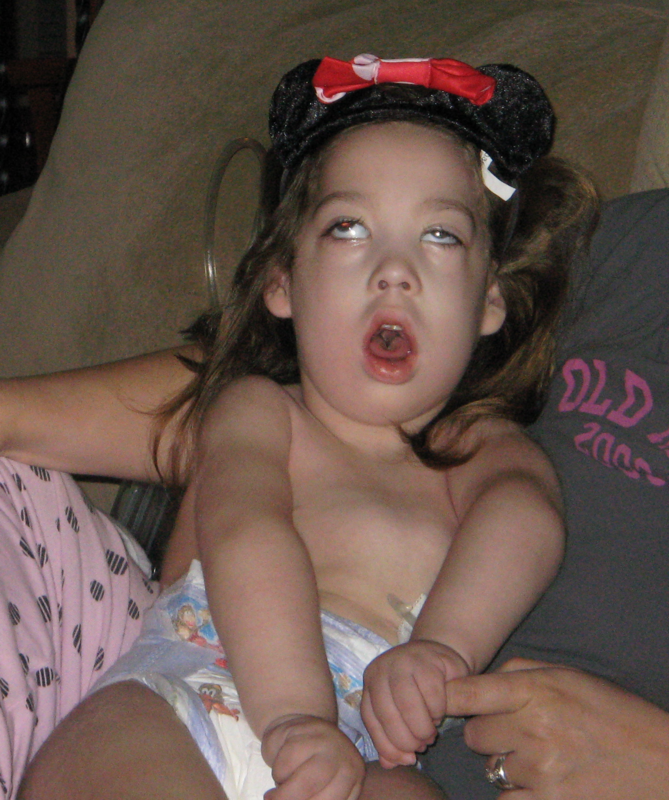 2009 was a tough Halloween. Casey had been sick for about a week before. We ended up in the hospital the next day were we stayed until early December. She was not up for wearing the Minnie Mouse costume, but she tolerated the ears long enough for a picture. 2010 Casey insisted on being a nurse. We had little scrubs made with her name on them and everything. She had a great time visiting her doctors and dressing up. 2011 Casey chose Tinkerbell. She has been all about princesses and fairies this year. She picked Tinkerbell right away and I think she chose well. She helped me make little puff ball socks and everything.